UNE provides Microsoft Office 365 to all enrolled students. It includes OneDrive and Office Web Apps. What does this mean to you as a student? You will have a free cloud version of Word, Excel, PowerPoint, OneNote and Excel forms. These features allow you to store, share and collaborate your studies directly from within your UNE email. What do I need to be ready to use Office 365? If you need assistance with updating your current browser, please contact the IT Service desk on 02 6773 500 or 1800 763 040. OneDrive is a personal library for storing and organising your academic documents. It allows you to work within the context of your study, with features such as collaboration within the student community. You will have 25GB of space in the cloud with OneDrive. That means a lot of storage for your study documents. All files that you store in OneDrive are private, BUT, you can decide to share them with nominated others by placing a file in the 'Shared with Everyone' folder, this will make it easier when working on projects with other students. 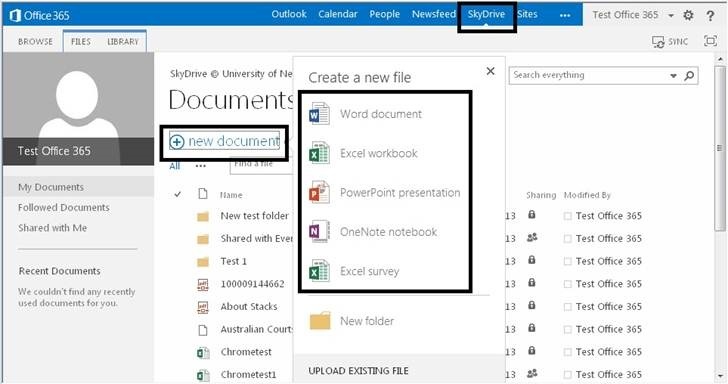 More information about OneDrive can be found on the Microsoft Office OneDrive webpage. Please be aware that OneDrive access will close down 30 days after your student account is archived (usually 9 months after you last enrolment). Do not use OneDrive as the only location for your files and make sure you regularly sync your files to another backup location (see below). Office Web Apps offer the ability to read and edit documents stored either within OneDrive or as attachments within emails. This means that you will be able to use standard Microsoft Office functionality directly in the web-browser, without having to purchase Microsoft Office. To access Office WebApps, log into UNE Office365 with your full email address as your username (UNEusername@myune.edu.au) and your UNE password. Select the OneDrive option from the toolbar along the top of your screen. Once in OneDrive, click on "New Document" to create a new document in the relevant application (see the screenshot below). For more information on these Apps please download the PDF from Microsoft Office Web Apps Product Guide. The OneDrive Sync App lets you synchronise your OneDrive Pro library to your local computer. If you have Office 2013 already, you will have the Sync App. If not, you can download the OneDrive Sync Client from the Microsoft website. You'll find your synchronised files in your File Explorer, under Favorites. Work on them locally and your changes will be synchronized automatically with your OneDrive library when you're online.